I have just added a post about “Cladograms and Evolution” which you may also be interested in. Please click on this link here to go directly to the post. Did you know that all living organisms can be classified according to “trees” or levels or hierarchies? The classification of life is referred to as Taxonomy by Biologists. I trained as a Biologist a long time ago, so I know that creatures (and plants) have scientific names or Species names, consisting of two words – one representing the Genus and the next word representing the specific form of the Species. Human beings belong to the Species “Homo sapiens”, or to the Genus “Homo” and to the specific term for the Species in question, being “sapiens.” Ancient human beings were called things like “Homo neanderthalensis”, or Neanderthal Man (or Woman). Click here to see an artist’s impression of the Neanderthal family. The Species is the smallest level of scientific classification that a living organism is classified or grouped into. A “taxon” is any unit used in the science of biological classification (taxonomy) and the term “taxa” is the plural for “taxon”. There are 7 levels of taxa (seven levels of units used in biological classification) as named below in the coloured boxes. Each taxon level (except for the Species taxon level ) is a group that contains at least one other taxon within it as a sub-set. 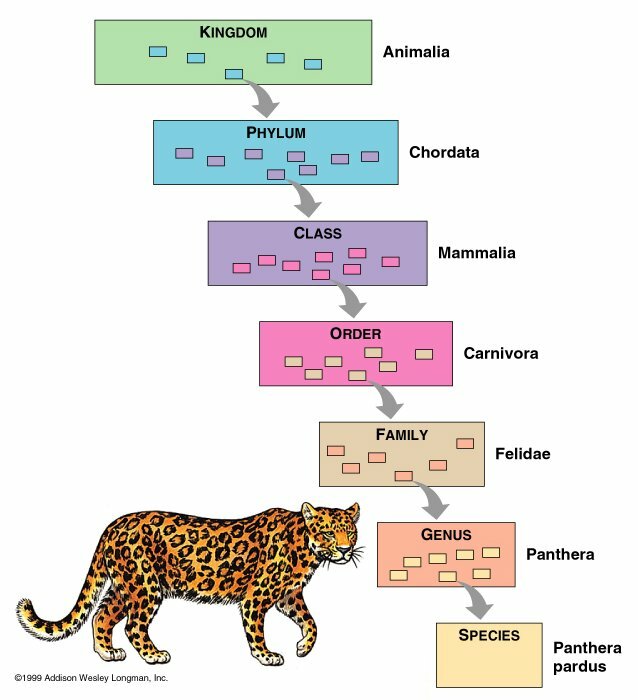 The taxa are sometimes said to be ranked, for example, a Phylum such as Chordata is a higher “rank” than the Class Mammalia simply because it contains more animals / organisms than the Class Mammalia. A Phylum is a taxon or scientific category of biological classification at a level amongst a seven level hierarchical classification system where it is below the taxon of Kingdom but above the taxon of Class. 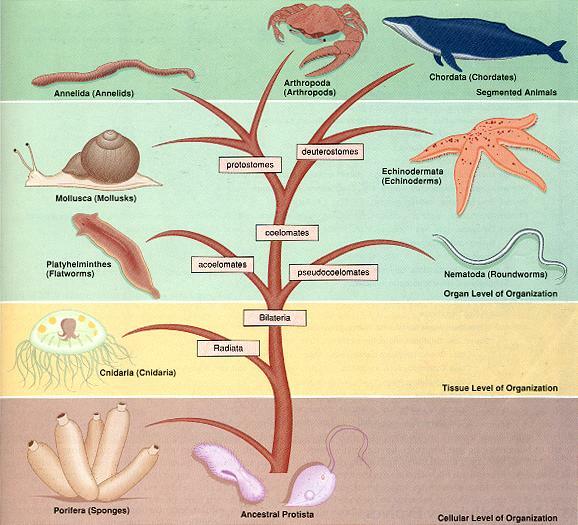 The specific phylum “Phylum Chordata” is a taxon (taxonomic group) at the Phylum level. Human beings, dolphins and bandicoots share the same taxon of the Class Mammalia, but belong to different Orders (or different taxa at the Order level, for example, dolphins belong to the Order Cetacea, and bandicoots to the Order Preramelemorphia). The above diagram shows a panther and where the panther gets its scientific name of Panthera Pardus from. The levels or categories of classification follow, from the largest category to the smallest. So we traditionally have four Kingdoms – Animals / Plants / Fungi, and in between – that is the Protista (or single celled animal/plant life forms). Within each Kingdom are several Phyla (and note “Phyla” is plural for Phylum), and so on, with each category including several sub-categories. Note that the Species name always consists of the relevant Genus name beginning with a capital letter, and the “species level” name with a small letter. Two names or Levels are used to name a Species, rather than just the one name (for example, “Pardus”) because the names chosen at the “species” level are not necessarily unique or exclusive to any particular Genus. For example, Gazella cuvieri is the scientific name for Cuvier’s Gazelle (a mammal) and Dryolimnas cuvieri is the scientific name for the white-throated rail (a bird). The Species level is actually called an “epithet” which means a “specific term for the species.” The species name includes the genus as well as the specific epithet. Scientific names are the same worldwide. This is Linnaeus’ system of Binomial Nomeclature. Binomial means two words and nomenclature refers to naming. Wikipedia explains that: In 1674, Antonie van Leeuwenhoek, often called the “father of microscopy”, sent the Royal Society of London a copy of his first observations of microscopic single-celled organisms. Until then the existence of such microscopic organisms was entirely unknown. At first these organisms were divided into animals and plants and placed in the appropriate Kingdom. However, by the mid-19th century it had become clear that “the existing dichotomy of the plant and animal kingdoms [had become] rapidly blurred at its boundaries and outmoded”. In 1866, following earlier proposals by Richard Owen and John Hogg, Ernst Haeckel proposed a third kingdom of life. Haeckel revised the content of this kingdom a number of times before settling on a division based on whether organisms were unicellular (Protista) or multicellular (animals and plants). Here it is again, shown nicely in a colorful picture. As CATS (Felis catus) are one of my favourite animals, I will present here the scientific classification of our small furry domesticated feline friends ! You can see how the classification of the domesticated cat differs to the Panther. The plurals for the levels are: Kingdoms, Phyla, Classes, Orders, Families, Genera and Species. 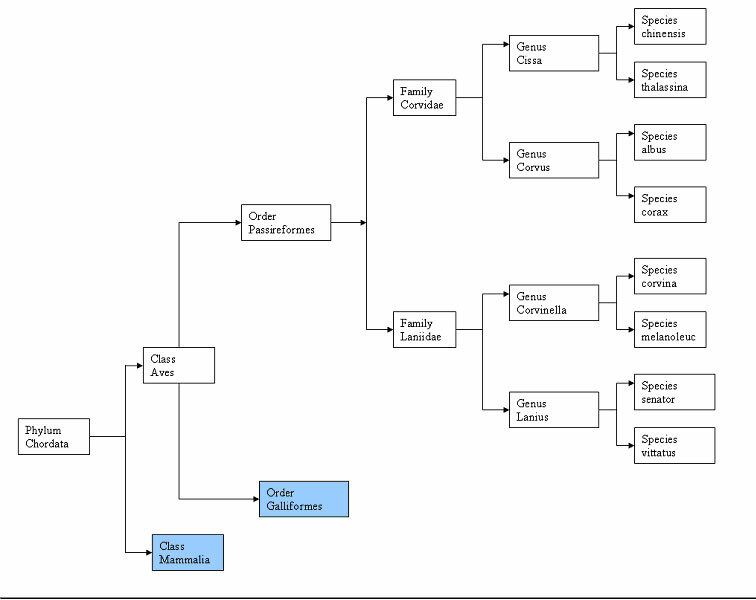 The above Chart is one I made up myself to show the Phylum Chordata divided into two Classes (Aves and Mammalia), and the Class Aves (or birds) divided into two Orders. The Order of Passeriformes (or perching birds) is further divided into Families, then into Genera and finally into species. The Species have common or generic names which you can find by visiting the Catalogue of Life website and expanding the drop-down options until you get to the Species level. I have put another Order of the Class Aves in a blue box, and the Class Mammalia in a blue box also, to denote that they are examples, which can be further sub-divided. You can get the idea from this Chart how numerous the scientific categories must be altogether! I made up a Poll myself with 2 choices of “acronyms” to hopefully assist you with remembering the order of the different levels of scientific classification. Please vote below, to show your choice, and click on “View Results” to see the votes to date. A good book like my textbook “Biology: The Web of Life” which I used at High School and still cherish, will show you quite a bit of taxonomical classification of both plants and animals, if you are curious about looking some classifications up. Now, below is a wonderful picture showing the placement of a selection of 9 Phyla (and let it be known that Homo Sapiens fall into the Chordata Phylum, which means “animals with backbones or vertebra”). Under the most frequently used classification scheme, there are 38 animal phyla. Certain systematists claim there are a different number of phyla, although always between 35 and 40. The vast majority of animals belong to just nine phyla: Mollusca, Porifera, Cnidaria, Platyhelminthes, Nematoda, Annelida, Arthropoda, Echinodermata, and Chordata. These 9 Phyla are represented in the picture below. To save you from rushing out and finding “Biology – the Web of Life” if you don’t already have it, below is a link where you can type in a scientific name like Homo Sapiens and find all the levels of classification. Try it out by typing Homo in the “Genus” field then typing Sapiens in the “Species” field then clicking on Search and being patient and waiting a while until the results appear. Click on the words “Homo sapiens” and it will take you to the full classification. You can also hover your mouse over “Search” on the left of the main page, then click on “Search for common names”, for example, to search for Cheetah. The resulting page will show the accepted scientifc name first in terms of the Genus followed by the Species, and then alternative names (by vairous namers) under the caption “Infraspecific Taxon”. Also, you can probably find out the scientific name for a “common name”, by searching on Google or another “search engine”, for example “scientific name for bluebird”. Try googling “scientific classification for bluebird” also, which will take you to a good Wikipedia page showing all the classifications the pretty blue bird falls into. I was amused when I saw the distribution of Homo Sapiens and thought to myself they forgot to add “space” also, seeing as human beings have been into space and to the Moon also. We sometimes forget that we are indeed animals with a distribution on Earth, and that we are dependent upon other animals and upon plants, not to forget upon the air that we breathe, to stay alive. Chart from: The Cambridge Encyclopaedia of Human Evolution, Cambridge 1992. Click on the picture above to see it in larger size please. 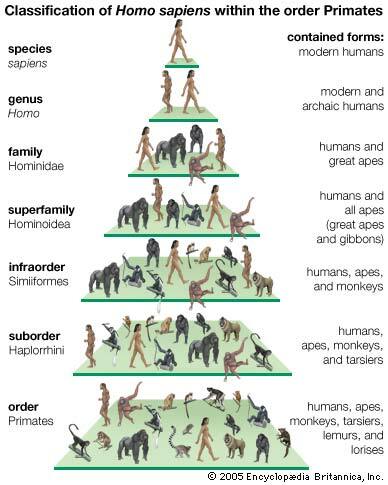 The above chart shows one Family of Primates, from 14 Families. You can find all the Family names using the “Catalogue of Life” website. To find out more about Hominids and Australopithecus, the first group of Hominids, please go to the page about “The Rise of the Mammals” by clicking here. If you are interested in investigating the conservation statuses of various animals and plants, please click here. Human beings whom respect Earth and Nature are pretty amazing animals! Hi Johno, thanks for your comment. Yes, I really feel a kinship with all of Life, and animals seem to gravitate toward me. David Attenborough says he respects all animals, and I do too. I try to talk to animals telepathically too (my notes about it are on the “Talk to the Animals” page). Animals teach me to be honest, playful, curious and appreciative of life. Thanks for visiting my Blog. I relearned a lot of stuff I have forgotten Celine! Thank you for compiling this.